Many of you have sent Young Tree Community good thoughts if not money as well. Keeping with our founders’ standards of blatant transparency we would like to update you all on the status of Young Tree Community. After several wonderful meetings and discussions about development between Andrew Harris, Claire Thomas, Gray Reilly and Byron Holcomb we charted a course towards sustainable development in Los Frios, Dominican Republic. On August 15th 2008, Claire and I left the US to evaluate the possibilities of work in Los Frios. Two weeks later Gray Reilly joined us for four more weeks. Claire and Gray made friends instantly in Los Frios. It was especially impressive how quickly Claire learned the names of many kids and taught them child’s games i.e. Duck-Duck-Goose, with very limited Spanish. Gray was teaching guitar within a week and became my right-hand-man on the farm. Everyone spent many an hour working on Finca La Paz learning the rhythm of life in Los Frios. Great strides were made in establishing a non-profit in the Dominican Republic. The rainy weather during our trip provided some serious setbacks. However, we were able cut a road to the site of the earth bag house and poured the foundation of the earth bag house. The community is very excited about learning how to make their own sand bag house. It was one of the first questions people asked Byron on his last trip in late January, 2009. We all had many solid ideas for Los Frios. We all came back motivated to do more in our communities. After the dust settled in October 2008, we all looked at each other checked our pulses and we have decided to stay in our current communities. Claire has applied to the Peace Corps and will make an amazing volunteer. Gray is working in Washington DC and will continue to support Young Tree Community. Byron still travels Los Frios often (4x per year), and will continue to work in quality coffee both in the DR (Young Tree Coffee) and in the US (Counter Culture Coffee). As we look to the future, we see our progress in Young Tree Community as positive progress for Los Frios. If the right person showed sincere interest and commitment, we would be happy to pass the reins over to them so they could pick up from here. We have returned back to the States safe and sound after an educational and inspirational seven week visit to Los Frios. While there we conducted interviews, meetings, and surveys to see what the community needs and wants that we can provide. We also began the production of the Sandbag house, which will be used as a meeting and storage space for the local ecotourism group. We also hope that the Sandbag house, which is all environmentally friendly and relatively inexpensive, will act as a model home for the people of Los Frios. The entire construction of the 46 meter square building cost $2000. Currently we have raised $1200 and are looking for an additional $800 to finish the project. If you are interested in contributing to our cause, please send a check to DevelopNET Iganga, 1217 Berkeley Rd, Avondale Estates, GA 30002 for tax-deductible donations. We appreciate all your support as does the community of Los Frios. 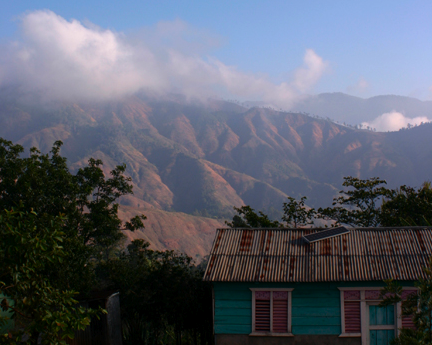 I arrived safe and sound in Los Frios, which is 5000 feet about sealevel and absolutely gorgous. I live with a couple who feeds me very good food, I sleep under a mosiqiote net, and I wake up each morning to the sound of roosters, motos, and other homes waking up. The view from my front porch is amazing. There are huge rolling hills and mountians for 180 degrees with a small lake in one of the valleys. It is seriously one of, if not the most, beautiful places I have ever seen. I have meet the majorioty of the community, as it is only a couple of hundred, and you have to shake hands and say hello to everyone you pass. I have really become close with the children here, and they all seem to know my name, even ones I have never met. Days when I am not working we all play together. I have taught a fair amount of the Los Frios kids Red Roover and Duck Duck Goose. We also race, play hand clap games, and some spanish games which I rarely understand. I dance with the preteen girls next door every other night and they have taught me Bachata and Meringue. When I am not playing I am working at the farm or on the house which we are buildin g as a model for Green Construction and for the Ecotour Guides to use as a meeting and storage place. I also watched the road be built by 40 community members which will lead to the house. I have sat in on a few meetings, and although I can understand a fair amount of Spanish now, am still struggling to speak it well. I am extremely content here. I love it. Life is so simple and beautiful. The one thing I have noticed most about being in the DR are that my senses are heighten to the tenth power. The sounds, sights, and smells here constantly suprise and excite me as I first arrived in the capital and later spent a few days in San Juan. We arrived in a tropical storm which was fine, just alot of rain. We toured the capital and then took a two hour bus ride to San Juan, the biggest city near Los Frios and the only place to get electricity and internet. It is a two hour ride in the back of an open bed truck up a mountain to Los Frios. 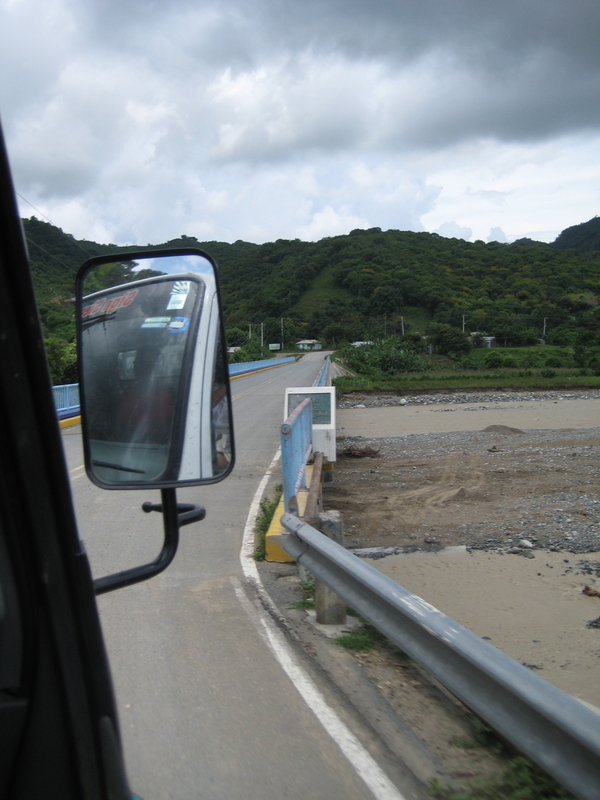 We will be leaving today, as the road was washed out the day before. It is amazing here. Providing efficacy, opportunity, and resources to farming families in Los Frios of the Dominican Republic.